Still making paddles! After a good amount of shaping and sanding, the cedar/walnut paddle ready for fiberglass. 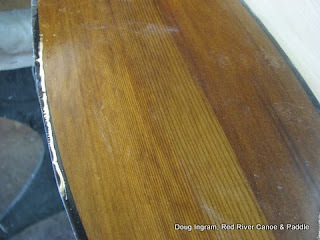 Cedar needs some extra cross grain strength when its worked this thin otherwise its very likely to split, and probably when you can least afford it! I used 2 oz. glass and epoxy resin. Here is what it looks like after the second coat of resin. It will need to be sanded again before varnish. 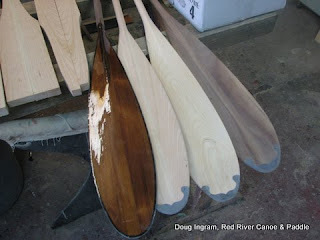 And a look at the first batch of paddles. One Birch, one Cherry, one Walnut, and one Cedar/Walnut. All good paddle woods. Posted by Doug Ingram at 10:57 p.m.